Today I thought I'd take you on a pictorial adventure through my office. I have three workspaces -- my beading table, my lampwork studio, and my office. I spend an inordinate amount of time in my office, answering emails, writing, updating my web site, filling orders, ordering beads, etc etc etc. Yes, I spend a LOT of time in this room. Grand Central Station -- the messiest part of my office. Computer, printer, invoices, to-do papers, half-done projects, things to be shipped, things to be ordered, cards to be mailed -- it all ends up here. I believe that anywhere you spend a lot of time and a lot of energy should be beautiful. To that end, I thought I'd show you a bit of myself by way of my office. It's a mish-mash of styles, colors, and levels of neatness, and I thought it might give you a little more insight into who I am. So get ready for a LOT of pictures! 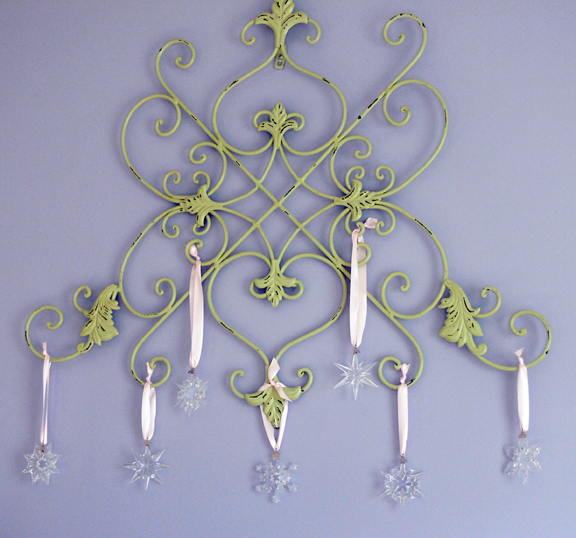 Above my desk is a vintage iron do-dad from which hangs Swarovski crystal snowflake Christmas ornaments, one for each year I've been beading. My husband gives me one each year, and I have one I need to hang up for this year. To the right of the desk is a credenza. 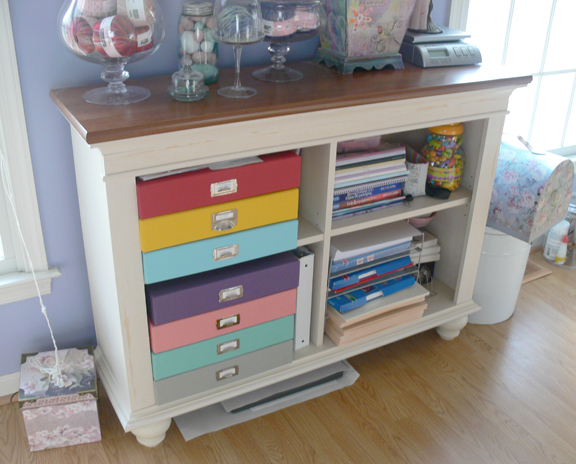 The top drawer holds mailing envelopes and ribbon. The bottom holds all my receipt files. On top are my two VERY vintage typewriters. The Blickensderfer is covered because it's so, so old, but if you click here, you can see and read all about it. 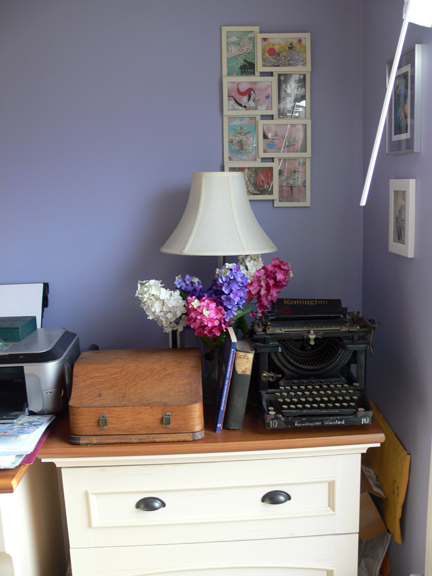 An old edition of Dickens is stuffed in between the typewriters, pictures by Vanessa Valencia grace the wall, and silk hyacinths peek up over everything. True to packrat form, the overflow of large mailers get crammed between the wall and the credenza. Yeah. Oh well. Wandering to the right wall, there are two big windows, and in between the windows is a low bookcase. In the bookcase, I have seven art files from Exposures, one for each of Zack's seven years, to hold special school papers, drawings, etc. We often spend time going through them, like a scrapbook. On the other side, I store bead catalogs, shipping labels, and various types of paper. Oh, and a huge canister of Pop-Beads. On top of the bookcase I have a lovely array of things. Postcards from favorite bead artists, my Shipping Muse on top of my postal meter, a gorgeous collaged box from Kecia Deveney, and balls of yarn in bell jars. Oh, but look! There's eggs! This year I decided not to keep up with two calendars and moved to one single calendar on the refrigerator. That left a delectable space on my wall, which I filled with a collaged painting by One Artsy Chick and a colored page circa Kindergarten by my little boy. Love. And how about a bundle of glittery hearts? Moving around to the wall opposite my desk you come to the photography table, a six foot table set up with photo props, strategically positioned to get the good morning light. Underneath the table I stow all the boxes of finished jewelry. It's an ENORMOUS tool chest. The top right side opens -- there's a compartment back in there where workmen stored their saw blades so they wouldn't get cut when they opened and closed the tool box for other things. ...and I just left it that way. I'm so tickled about this new addition to my office I could just cry and laugh at the same time. Above the photo table is a ledge I bought from IKEA, and it's full of random things as well -- a transformer in aqua, a handmade whimsical fish, a bottle collection -- no rhyme or reason, stuff is just -- there. Contemporary handmade fish, vintage books and photos, faux vintage birdhouse, vintage spoon and lids. 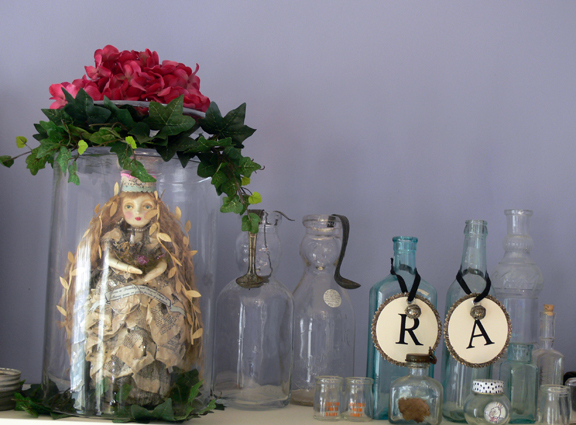 Handmade doll from Vanessa Valencia, vintage milk bottles with cream spoons, vintage bottle collection, glittered letters. Rounding the corner and the last wall, we hit the "collector's cabinet". 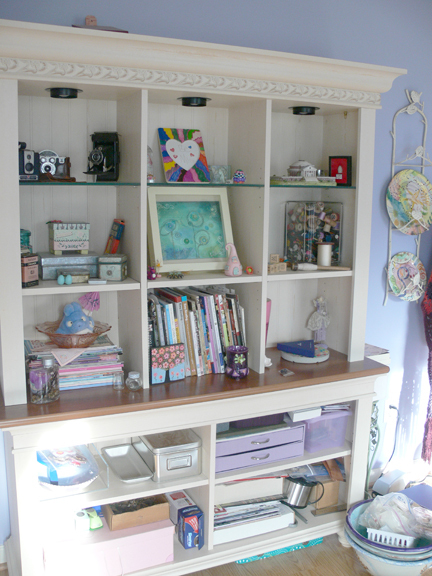 Originally meant to be a bookcase, it's overrun with books, magazines, craft supplies, vintage goodies, Etsy finds -- all sorts of bits and pieces. 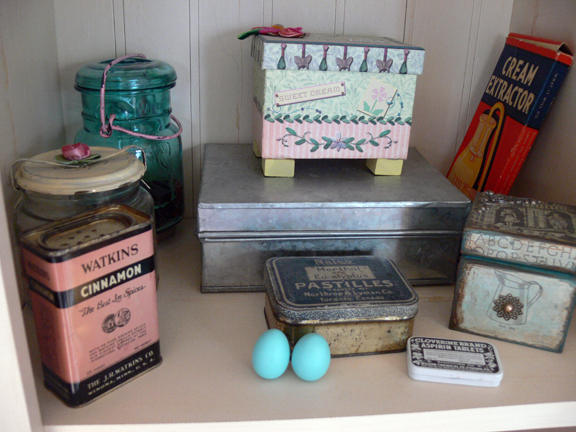 Vintage tins (the Pastilles tin is my grandmothers and holds her sewing pins), more eggs, a silver box of my rarest buttons, and a paper box full of charms from a charm exchange group. 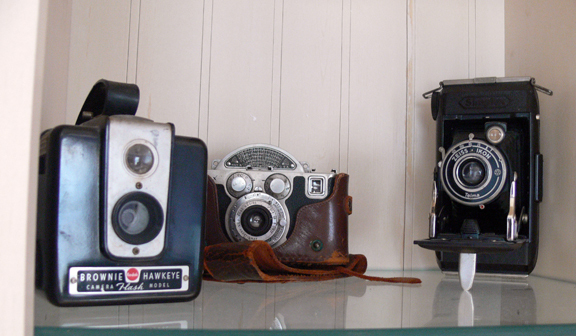 Three of my many vintage cameras -- these were among the first in my collection. A picture by Zack on top, a polymer clay egg, a collage by Kerry Bogert, a fairy house by Vanessa Valencia, a pop bead ring I made with Zack, more little goodies. 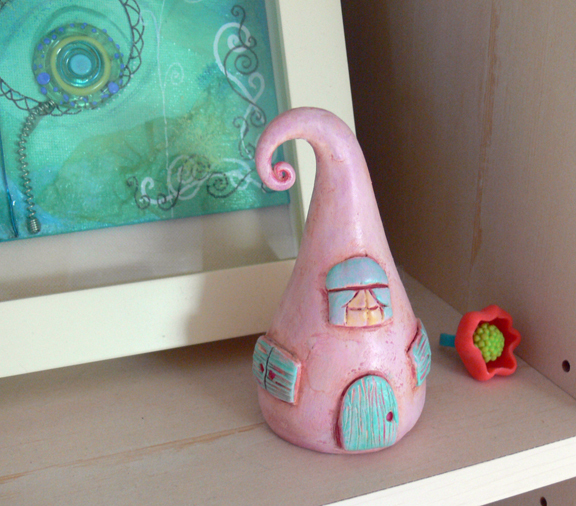 A close-up of the fairy house. 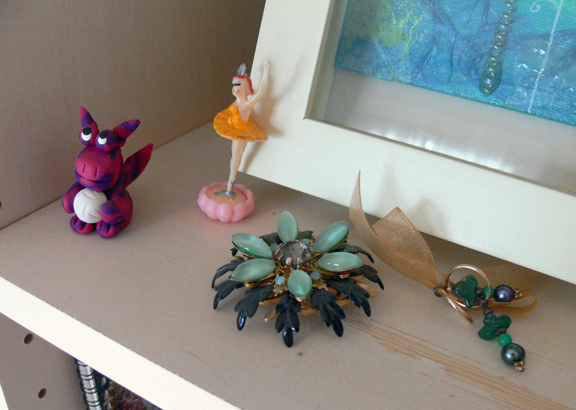 A close-up of a Miriam Haskell pin gifted to me by a dear friend, a polymer clay dragon, a plastic ballerina. 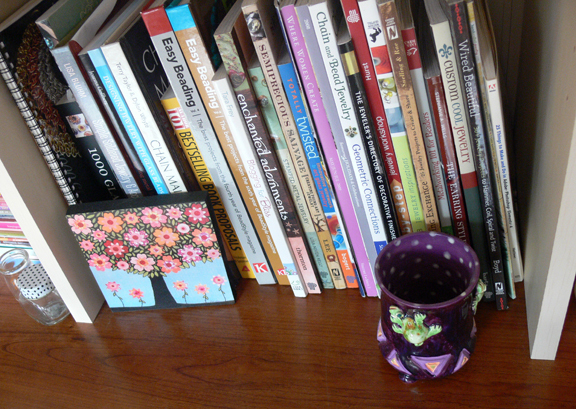 Tons of jewelry books to read, adorned with a block painting and a handmade pottery cup with frogs on it. 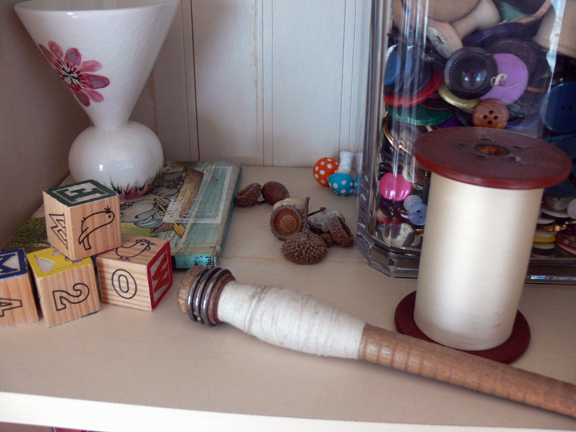 Baby blocks, a vintage spool of thread and spindle, large vase of vintage buttons and thread, acorn caps Zack and I picked up, felted mushrooms, a vintage book about sneezing hippos, and a vase I painted. Beside the collector's cabinet is my dressmaker's dummy, ready to do duty should I need a necklace modeled. 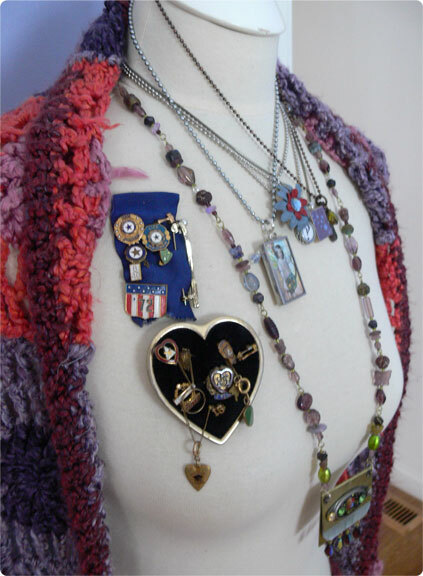 For now, though, it models some favorite necklaces, and its newest finds, my mother-in-law's passed-on sister's medals. The top medals are from the American Legion, and the ones on the Heart are from a Purple Heart association they belonged to because their father received a purple heart. I'm so fortunate to have them. And finally, we pass the door and hit my desk again. 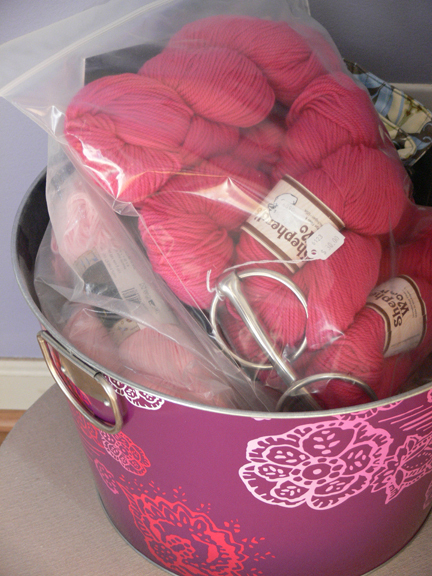 On the left side of my desk is an ambitious pile of yarn, waiting to be knitted into a purse. Thanks for indulging me on my tour of my office. I like knowing you know where I work, and you're welcome any time! 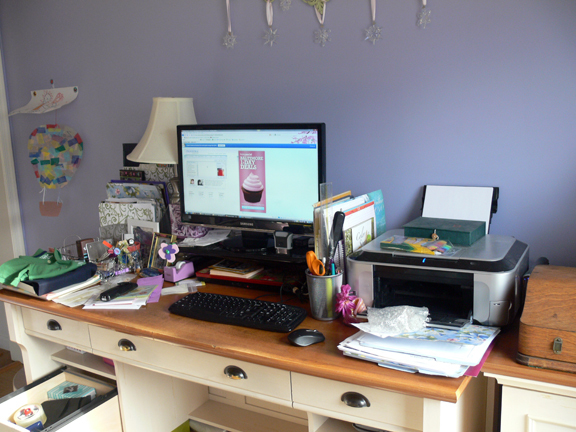 I'd love to see YOUR work areas -- why don't you blog about them and let me know? It looks like you've had a lot of fun putting some "you" into your workspace! I think expressing oneself physically in a space like that is both therapeutic and affirming of who we are! And it helps when you want to be there. Ha. My "office" has elk antlers, a batik from Zimbabwe and man underwear in it. And occasionally the man too when he stops in for a kiss! your workspace is so pretty and so much neater than mine! Colorful, creative and happy space. Must be fun to work there. You've given me some great ideas for my studio! I'm just starting to get things in order there! I have no idea what to do with it all!! 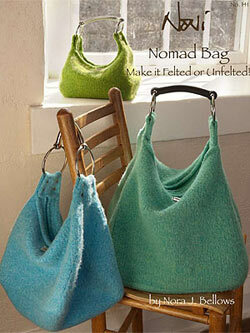 And I'd really like to find that purse pattern! I love it!!!! Ok, see now if you went around my room you would find dog hair and dust and the random stay bead, meh. So beautiful and totally you. Lovely! I'm not ashamed to admit that I am green with envy over you workspace. Thanks for the tour. What a great workspace you have and such calming colors! 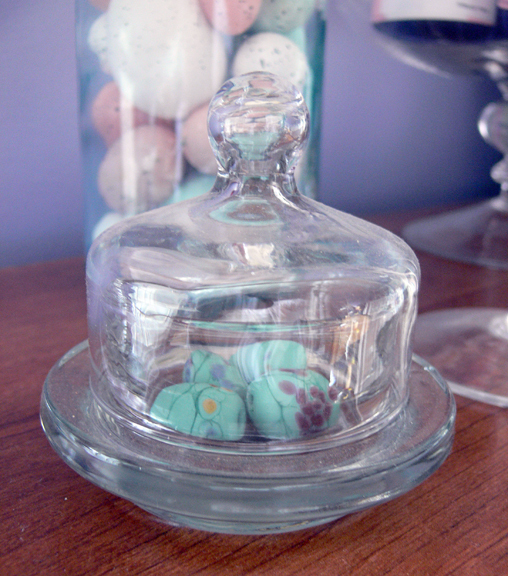 I love all the pieces by Vanessa Valencia you have and feel honored my little eggs are in such a protected spot. Thanks for sharing your office, Lori! You have lots of pretty things in your space, I really want to have more of that. My space is quite utilitarian. Lori, I love your work space. It honestly does look like you! It's a beautiful place to create! 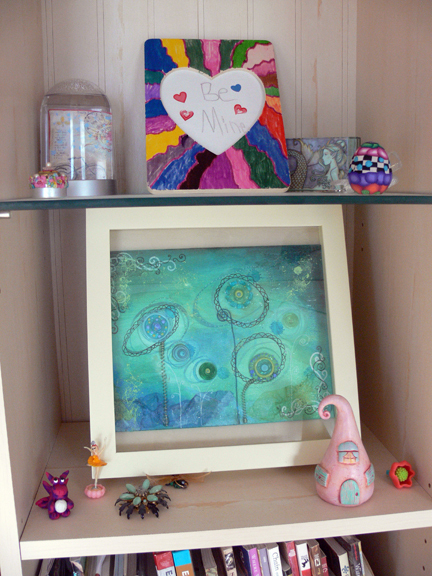 Your space is like an etsy showcase - I love it. Oh my... that is one bright and cheery space! I am sitting at a folding table heaped high with to-do lists and hovering underneath are boxes filled with what-nots. One my floor are more boxes, bags of trash and my indoor photo studio with the light and the vellum tacked over it to simulate sunshine (not quite working). Your space is light and airy and the perfect place to lose yourself in deeply creative endeavors. I love it, Lori! My space aspires to yours! Inspiration Inspiration everywhere!! What a wonderful tour, thanks for sharing. A special office.....with special things. I even see a few items that I think I know who made them. Thanks for sharing your lovely space with us. Your workspace is great! 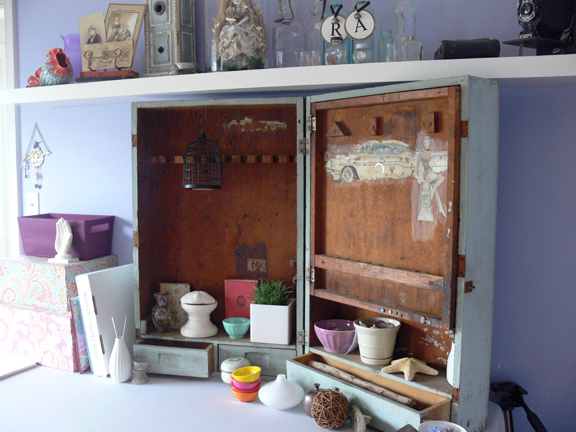 I love all the small things that you've collected, they make the room very warm and cozy! Oh wow - thank you for the trip through your office space, it is fantastic. I am drooling! I especially love the old cameras and typewriters, they are so awesome. Your space looks like a wonderful place to work, you are one lucky woman. That is a gorgeous office! I love that you've taken the time to make it a place you enjoy being and surround yourself with the things you love. My favorite part is how organized it looks. Mine is a DISASTER. I hate being there because it's such a mess. Thanks so much for sharing your private space. 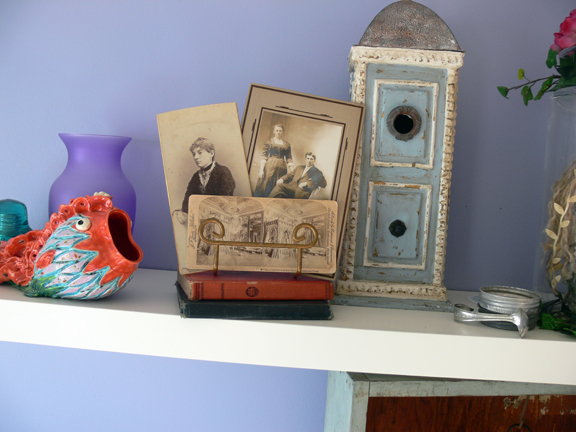 I love the tranquil wall color and all of your antique pieces, lovely! I loved this post! What a wonderful workspace you have. I especially love the typewriters! You've inspired me to do a similar post sometime this year. Love it! Your space is inspirational. I get it with the vintage comment. My hubby doesn't understand it either. 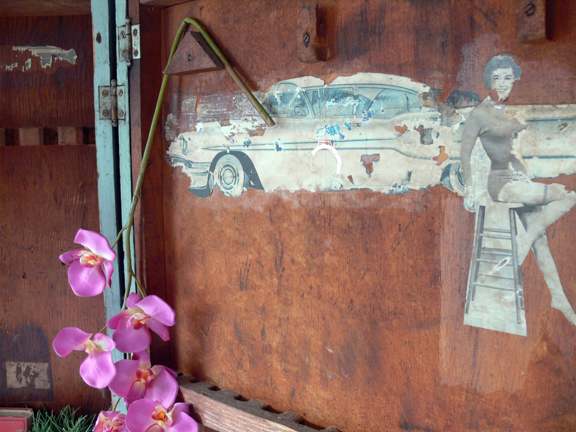 The history (real or imagined)behind each piece is inspiring in itself. Thanks for sharing. Thank you for sharing your studio Lori. I love to see where fellow artists create. You have inspired me to clean up my studio and blog about it! What a great space very light and bright. It looks like you! loved the tour Lori...and it's SO organized! Such a nice space to do your office work. I am so jealous. Mine is organized but not at all personalized. I need to get in there and paint and all that jazz. 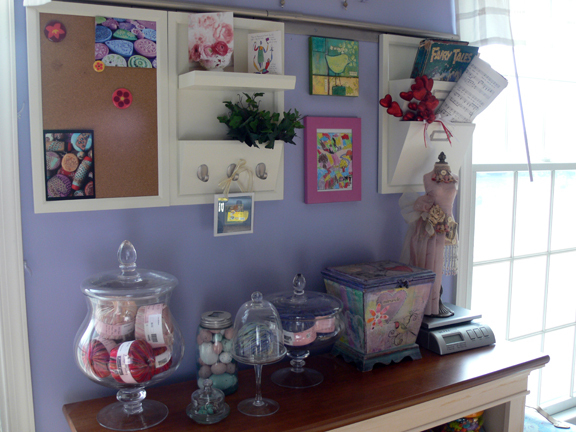 What a beautiful, happy space you have for creating, Lori! I really enjoyed taking a tour with you :-) Thanks for sharing! so pretty and beautiful! I am in LOVE with the old tool chest! co sool! lucky! Love. This. Wow, Lori! Simply incredible to me! 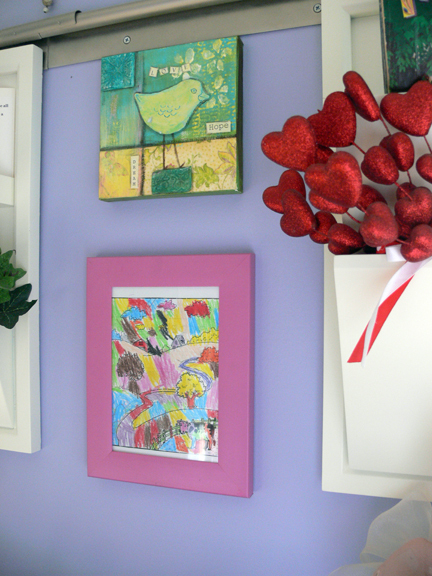 You're so lucky to have a whole room dedicated to creativity! I have a table that, for eight months of the year, is a desk where I study for my business degree!